﻿ Galatasaray 3-2 Real Madrid. Never take anything for granted! 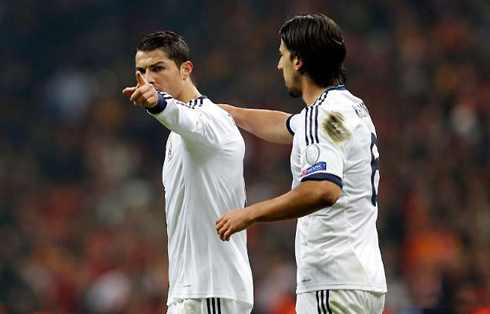 09.04.2013 » Galatasaray 3-2 Real Madrid. Never take anything for granted! Who would say that Real Madrid was still to be sent against the ropes in Turkey? The Merengues lost 3-2 against Galatasaray this Tuesday night, but advanced into the Champions League semi-finals, thanks to the 3-0 home win from last week and a final 3-5 result on aggregate. 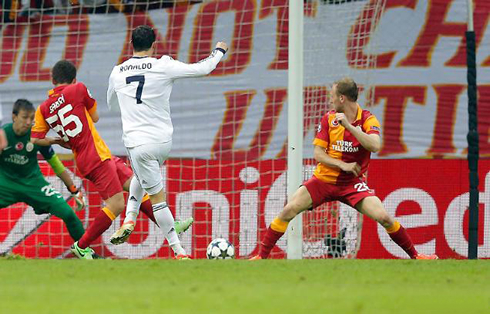 To Real Madrid rescue came once again Cristiano Ronaldo, as he was the one scoring the two goals for the Spanish side. The atmosphere at the Turk Telekom Arena didn't let anyone down and these are the kind of stages and nights that no football player involved in the game will surely forget. More than 50,000 people attended this Tuesday's night match and witnessed in first hand to another Cristiano Ronaldo opener, right around the 8th minute of the game. Mesut Ozil's short pass met Khedira on the right, and the German "Panzer" didn't lose much time to cross it into the middle for Cristiano Ronaldo to flick it into the back of the net. With that first goal in the game, Real Madrid knew only a calamity would prevent them from moving on to the Champions League semi-finals. From that moment onwards, Galatasaray was forced to score 5 goals without conceding any other, that is, if they were still wanting to be taken serious about advancing into the competition's next stage. The last time the Merengues had suffered 5 goals in an official game was against Barcelona, on that famous 5-0 night at the Camp Nou. Those last 20 minutes of the game suddendly gained a whole new meaning. It was no longer a matter of letting the time go by and simply wait for the final whistle, but it was rather a period where everyone had to realize the need of giving their all once again, as if their attitude could be turned on and off like a normal switch. Alvaro Arbeloa was shown a double yellow card in the 90th minute of the game, in a totally avoidable incident, but that event single-handedly didn't prevent Cristiano Ronaldo from giving the final blow to Galatasaray and establishing the final result in 3-2 (3-5 on aggregate). Real Madrid move on and so does Borussia Dortmund, who knocked out Malaga in the dying minutes of their game, with two goals in added time. This Wednesday night, we'll get to know who will join them in the semi-finals draw, but my money will be on Barcelona (vs PSG) and Bayern Munich (vs Juventus). As for Cristiano Ronaldo, his contribution to the team is just beyond words and there's not much we can say to really make justice to how important he is for Real Madrid these days. If there's a "Messi-dependency" in Barcelona, then there's surely a "Ronaldo-dependency" in Real Madrid. The Portuguese forward is the Champions League top goalscorer, with 10 games played and 11 goals on his tally. As for the all competitions in the whole season, Ronaldo now has 48 goals in 47 games. Quite simply out of this world! 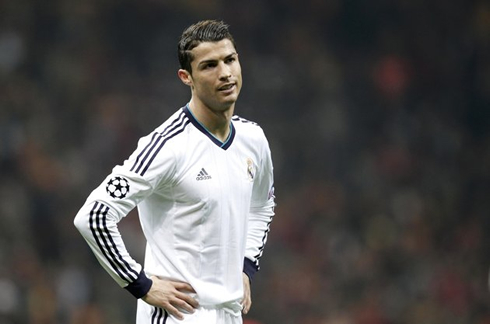 Cristiano Ronaldo next game for Real Madrid will be an away one, against Athletic Bilbao, on April 14, 2013, for the Spanish League. You can watch Juventus live stream, Athletic Bilbao vs Real Madrid, Barcelona vs PSG, Juventus vs Bayern Munich and Basel vs Tottenham, all matches provided from our soccer live section.